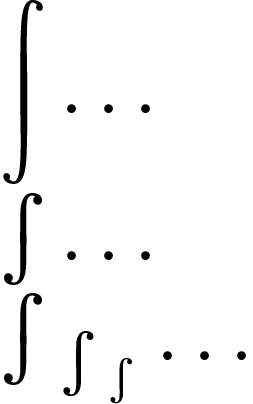 Is there a way to use only the symbol from the integral of the package euler without loading the whole package? With the legacy type 1 fonts, look up the symbol in appendix D of the amsfonts manual. The \int symbol is in the font euex, and we see that the display-style \int is in slot "5A and the text-style \int in slot "52. Therefore, we can load this font as a math alphabet and select the appropriate style using \mathchoice. And likewise for \oint if you need it. Not the answer you're looking for? Browse other questions tagged symbols euler or ask your own question.